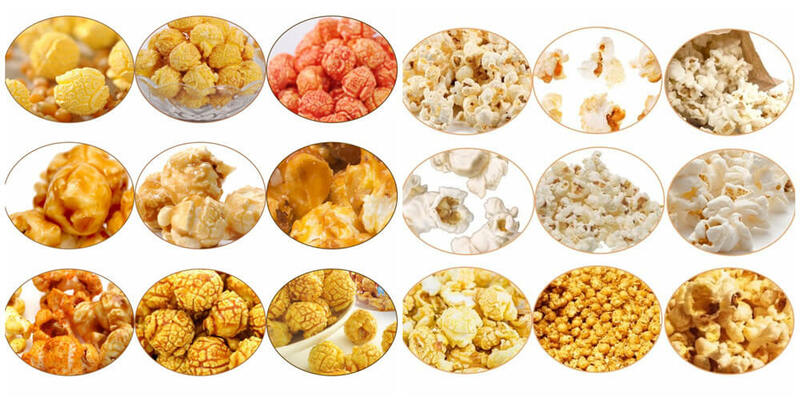 As one of the popular snacks around the world, the consumption of the popcorn is more and more and our caramel popcorn production line can meet the large demand for the popcorn. This line consists of 6 independent machines with a large capacity of 80-100kg/h. We can also add the independent machine to the line according to your other producing needs. 4. High automation, labor saving. It is applied to dry and puff the popcorn, corn flakes, starch pellets, extruded snacks, vegetables, and grains. In addition to roasting nuts and coffee beans or pasteurizing ingredients. The hot air popcorn popper-the main engine of the caramel popcorn production line is used to dry and puff the corn, it is equipped with compelling ventilation heating system, inner layer airflow baffle, accurate temperature control and tricked insulation layer which makes it a compact and supremely energy efficient process unit. This machine is assistant equipment of this line, to convey and hoist the material to the next machine. It improves the automatic degree and saves labor. 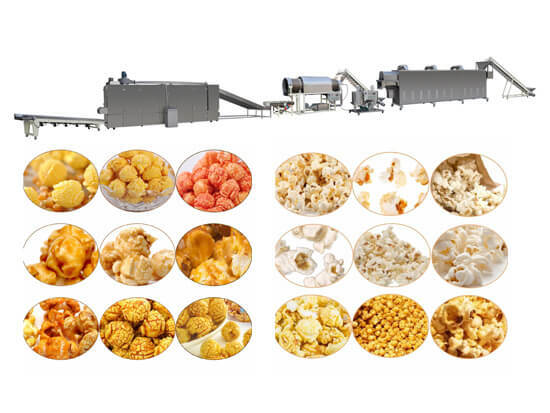 After the corn rotating-cut by popcorn making machine, it is with high temperature. The vibrating distributor is used to cool the popcorn. Vibrating screen and discharge port are made of stainless steel to keep production cleaner and appearance more beautiful. Put the dried materials into the roller through the elevator, when the rolled rotating, add the syrup into the spraying machine, spray sugar in the surface of the food. After the sugar sprayed, the popcorn will enter the oven automatically, to vaporize the water inside the sugar. This equipment has many advantages such as multipurpose usage and heating system balance and so on. When delivering machines we can provide some related parts for free, such as conveying belt of elevator, relay, current meters and so on. The video is also available. For more information about the machines, please feel free to contact us.